Was one of them Banoffee?? 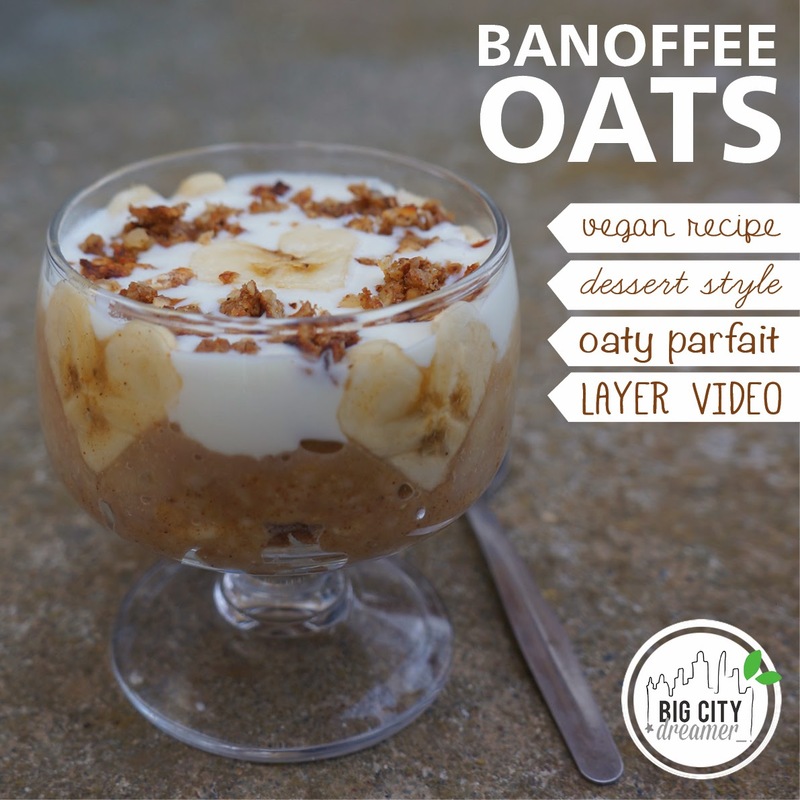 If so, then you will LOVE this Banoffee Oat Parfait.... all the creamy banana-ey caramel-y goodness of the traditional dessert without the fat and added sugar ingredients... did I mention it is also vegan? Perfect for breakfast, dessert or even a snack! 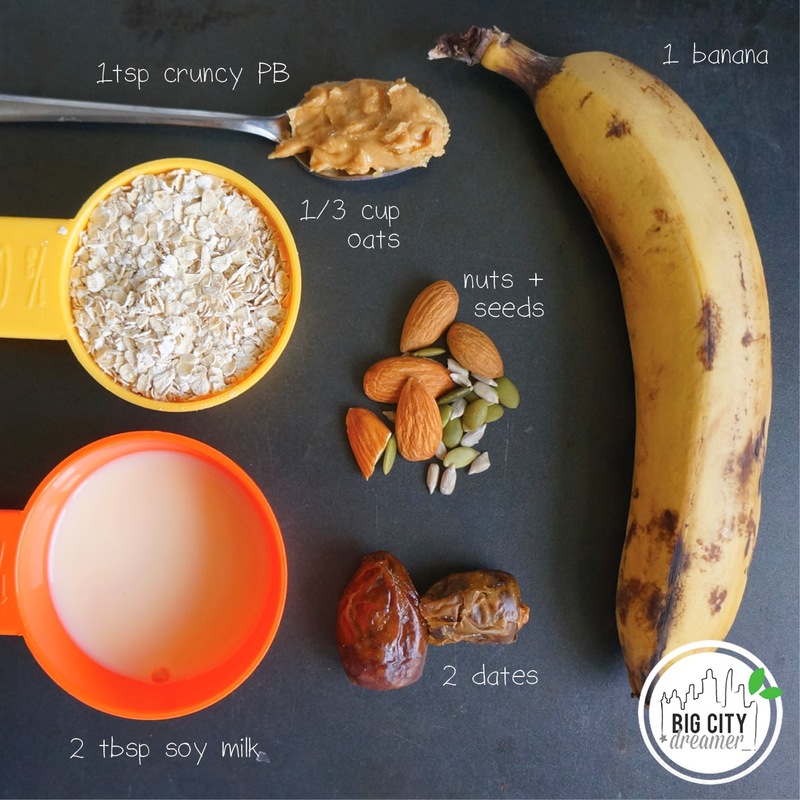 Read on for the recipe (it includes banana, dates and oats...it's impossible to go wrong really)! 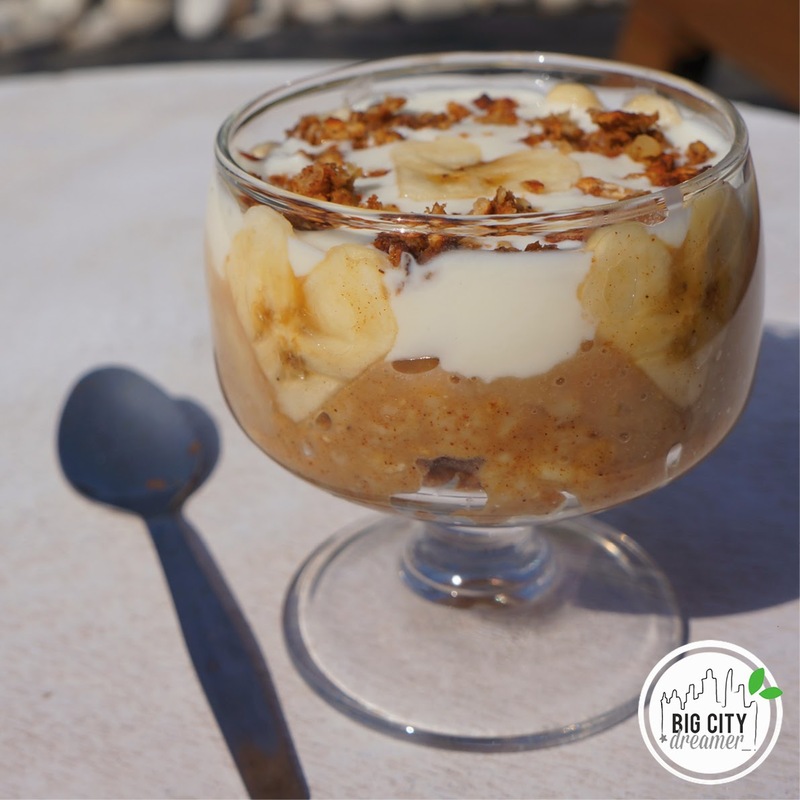 Combine 1/4 a large ripe banana (mashed), a sprinkle of cinnamon, 1tsp crunchy PB, 1/6 cup oats and some chopped almonds and seeds. Mix all together and spread onto a baking tray (preferably on greaseproof paper...I didn't have any left) and bake under a medium heat grill for 10 minutes, turning over half way through. Break up and leave to cool and crunch up. This would also be great as a healthy muesli on it's own! Combine the remaining 1/6 cup oats and 2tbsp soy milk. Cook for a minute or so. Add date caramel (Soak the two dates in hot water for two minutes, remove and mash. Slowly add back in the hot water, mashing until a caramel consistency is achieved), cinnamon and agave or honey to sweeten (I also added some coffee granules which worked surprisingly well)! 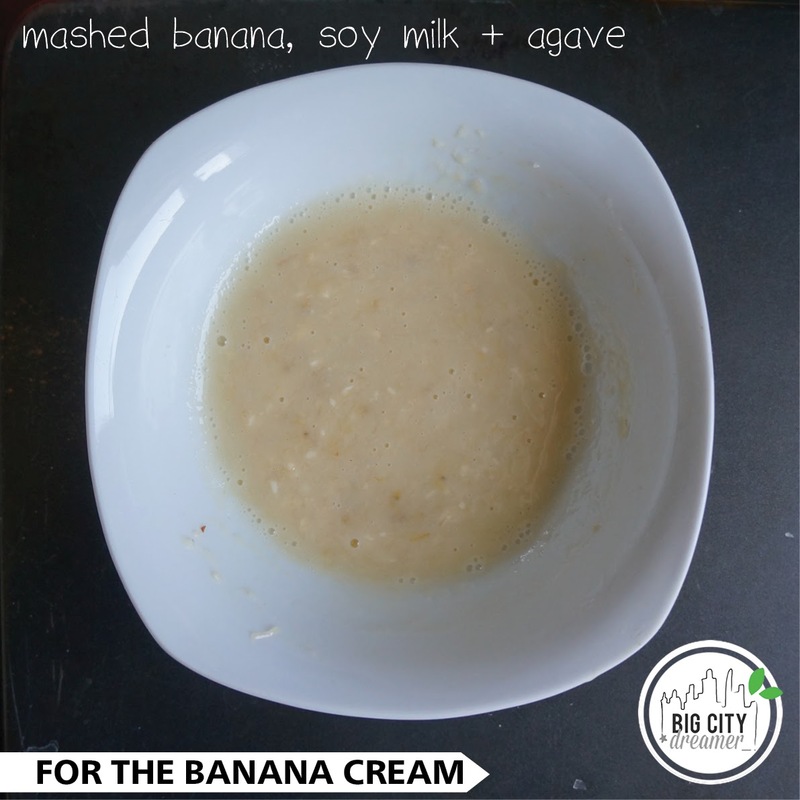 Mash 1/3 banana with 2tbsp soy milk, 1/2 tsp vanilla essence and agave or honey (if not vegan) to sweeten if desired. *Please note, if you're not vegan, I thoroughly recommend using slightly watered down 0% Greek Yoghurt (like Fage Total Greek) in place of the soy yoghurt and milk! Mash 1/3 banana with 2tbsp soy milk (or 0% Total Greek), 1/2 tsp vanilla essence and agave or honey (if not vegan) to sweeten if desired. What are some of your favourite desserts? I have a few still to post (Chocolate Mint Aero, Baklava, Cinnamon Roll, Pancakes, Chocolate Tart, Oreo Cookies, Apple Pie...okay, that's more than a few) but it is my aim to healthily every dessert possible so let me know if you have any ideas!